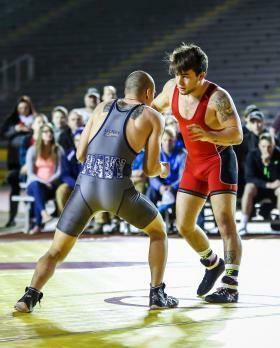 Marquette, Mich.—The Northern Michigan University Olympic Training Site wrestling team will face off against the All-Navy team on February 13. The event will take place on-campus at 7 p.m. in room 150 of the PEIF building. The dual meet, which will feature both Greco-Roman and freestyle, is free and open to the public. The All-Navy team is comprised of active-duty sailors in both the Navy and Coast Guard. The All-Navy Sports program allows sailors to serve as goodwill ambassadors while also carrying out their military service. The team is training at NMU from January 26 – February 22 in preparation for the Armed Forces Championships. NMU-OTS head wrestling coach Rob Hermann is no stranger to the U.S. Navy. He served in that branch of the military from 1976-1998 and he was the All-Navy wrestling coach from 1983–2010. “It is great having the All-Navy team come to our room to train,” said coach Hermann. “This will benefit the Navy and the NMU-OTS wrestlers. Our dual meet with the Navy will be our only local competition this academic year and I hope everyone will come out and cheer the guys on,” he added. For more information on the NMU-OTS program, visit www.nmu.edu/ots or contact resident coach Rob Hermann at 906-227-2869 or rhermann@nmu.edu.